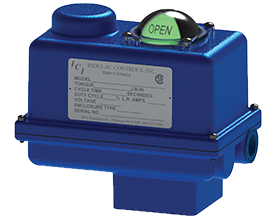 SD Series | Indelac Controls, Inc. 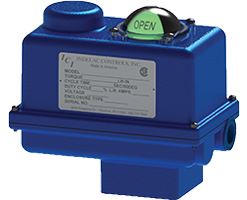 The SD series compact rotary electric actuator was specifically designed for valve sizes from ¾” to 2½” and dampers that do not exceed the rated torque of the actuator. These heavy-duty reversing actuators develop 200 lb·in (model SD) and 300 (model SDX) lb·in torque and rotates form 0 to 90 in 5 seconds. The spur gear drive train has been designed for severe applications and, as in all ICI actuators, can withstand stall conditions without suffering gear failure. 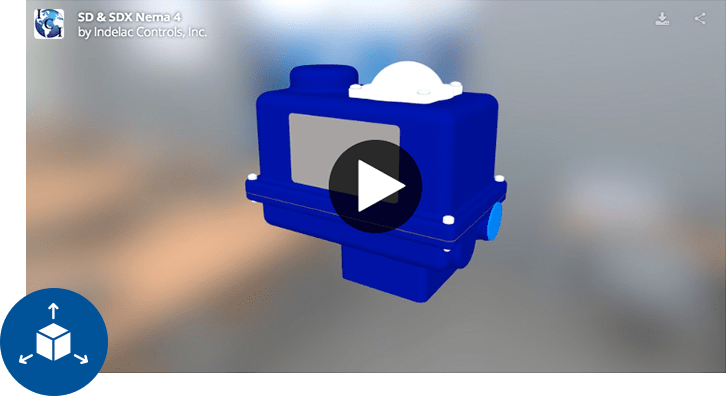 The heavy-duty die-cast aluminum enclosure meets NEMA 4 specifications and has a thermally bonded ultraviolet resistant polyester powder coating that not only enhances its appearance but also is a tough corrosion resistant coating. Standard equipment includes 115Vac-1ph motor with thermal overload protection, two limit switches wired for light indication, stainless steel fasteners, captured cover screws and 300 series stainless steel output drive, spring friction brake, non-declutching manual override and position indicator. Optional Voltage: 12Vdc, 24Vdc, 24Vac (24Vdc rectified) with manual reset (turn off then back on) overload protection. 230Vac-50/60Hz-1Ph.with automatic reset thermal overload protection and spring friction brake. 115Vac. = .75 Amps., SDX – 1.0 Amps. Die-cast aluminum with 300 series stainless steel captured screws and thermally bonded polyester powder coating. NEMA 4X Sand-cast aluminum with 300 series stainless steel screws and manual override shaft and thermally bonded polyester powder coating. Output Drive: ISO 5211 F05 (14mm female star) 300 series stainless steel. Temperature: -40° F to +140° F (heater required at 0 F. and below). AVAILABLE OPTIONS: Extended duty (75%) motor (cycle time = 10 sec./90 ° ), maximum of 4 auxiliary switches, power-off brake, declutching manual override with handwheel, feedback potentiometer, 4-20mA positioner (equipped with 24V dc power supply for transmitter), 4-20mA position transmitter (requires 24V dc power supply), compartment heater, heater and thermostat, breather, three-position control, light indication, two-wire control, timer, speed control, remote/off/local control panel, electronic torque sensor and one additional ½” NPT conduit entry.